My turnaround is 3 to 4 weeks for motor/rotor service, 4 to 6 months if the clock is sent with the motor/rotor, or the movement is overhauled and expedited service adds $100.00 for rotor only service and doubles the labor on the movement overhaul. Expedited service take about 2 weeks for motor/rotor service, one month if the clock is sent with motor/rotor, or the movement needs to be overhauled. For motors and rotors not found on this Web page, I would need you to send a digital picture of the item using both top and bottom views. Please remember that each motor or rotor in the body of this Web page have clickable links to their individual Web pages and pictures. Any rebuilt Telechron "B" rotor can have any shaft you'd need. Here is a Web page with some of the steps illustrated with pictures. Clock Motor & Other Clock Motor Repair and Service Charges. Special on Aluminum New Old Stock (never used) 60 RPM Chart Recorder and Clock Motors (M-3583) "BC-3"
What if the clock needs more service? My business is rebuilding your original rotor. trade discount of any kind. but you would be responsible for the shipping costs to Mike's Clock Clinic. means an old but unused rotor/motor and for used but working. working motor then the $100.00 is still due and all work is done in Clinic. the motor/rotor before I accept it for expedited work. the clock is sent with motor/rotor, or the movement needs to be overhauled. for the replacement service. I can ship at that price for clocks up to 22" long ($260.00). 100% of the time, simply because the clock movement (mechanism) may need work as well. separately run outside the movement and rotors cannot. significantly quieter but all will carry some noise. coagulated oil and nothing for plate and wheel wear. a need for more oil. a source for newly manufactured coils, so when my stock is gone it is gone. replacing the coil if yours is not the proper wattage. depending on the setting of the meter. Some have indicated to me a fear of the clock shorting out or becoming a fire hazard. If that's the case then purchase a power strip and only plug the clock into it. but putting in a power strip may ease some fears. entire clock then it becomes 4 to 6 months. All my Telechron rotors are either nickel or copper and NOT aluminum. The exception is the "S" rotor which has always been aluminum. The aluminum rotors were cheapened versions of the nickel or copper rotors. 70's and that's when the aluminum rotors appeared. around is a few days assuming you send the $165.00. "H" rotor. The aluminum "H" rotor substitution is the standard 6 to 8 week turn around. located in your sleeping area. were manufactured after your clock was made in order to save production costs on replacements. in phenolic resin, instead of copper. by the # of the original rotor. I.E. 59M2377. then it is shipped and will carry a 2-year warranty. then weave it in and out of the chime rods. A one inch wide  strip is all that is needed. Installing the Telechron "B" rotor is a fairly straight forward job. There are two large, usually brass, screws which hold the entire "motor". then the pinion will slide off and this can happen when you remove the "motor". installation can usually only be done once the rebuilt rotor and the rest of the "motor"
is installed in the clock's movement. There is a brass collar at the point where the shaft protrudes from the rotor. enters the clock movement. This collar makes sure that rotor is seated properly. connecting to the larger wires, which eventually connect to the power source. the "motor" with great care. Installing the Telechron "S" rotor is a fairly straight forward job. being placed in exactly as the old rotor. There is a brass collar at the point where the gear protrudes from the rotor. Another problem is that the "S" rotor is usually held by the field very tightly. Sometimes I have to use a flat screwdriver in order to remove the old rotor. because this might damage the NOS rotor. I generally install the "S" by hand using only finger pressure. to install the rotor because of potential damage to the rotor. Jefferson Golden Hour & has on-line pdf files on the schematics. 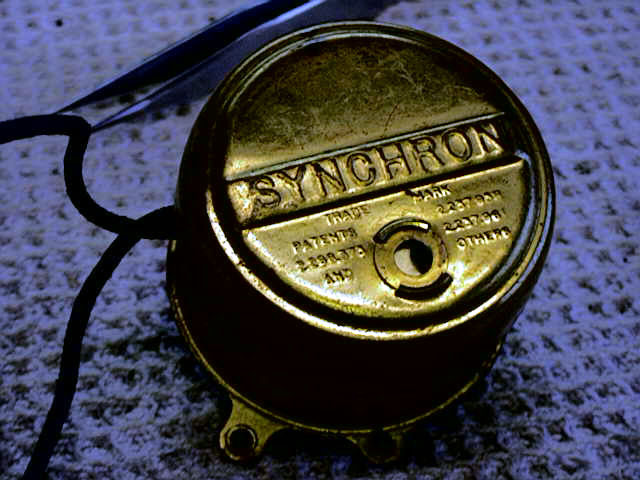 Hansen Corporation carries some of the Synchron motors. As does American Time and Single & Timesavers. 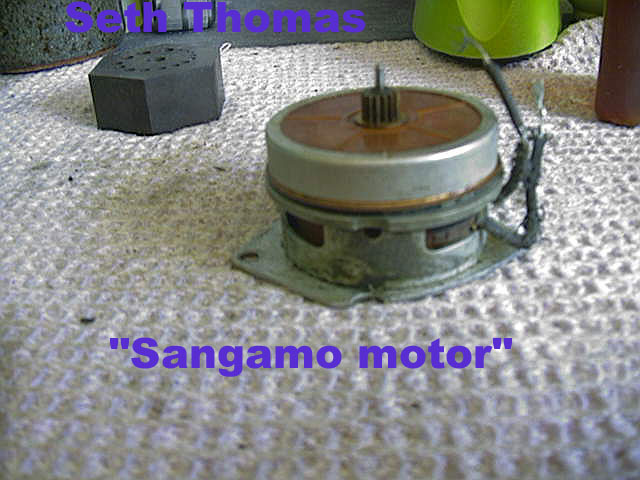 A special note on the Seth Thomas clocks that used Sangamo motors. the old motor at time of payment. specific motor rebuilt my turn time becomes around 3 months. for the replacement service. I can ship at that price for clocks up to 22" long. motor will be marked for identification purposes. clock, you are wasting both my time and your time. Norkro carries Lanshire's XL-7's that they have rebuilt and can rebuild yours. a new replacement part, which is very rare. the center of the minute hand with your fingers and see if it wobbles. Meaning that there should be a very slight amount of "up, down, or side to side" play. have to be rebuilt in order for the clock to run properly. Also, I overhaul most plug in electric clocks. In continuous service since 04/01/1982.